“The 7 Auric Field Layers”, “The Circle of Joy: Five Elements for Giving & Receiving The Pure Love of Christ” and more! To provide a basic understanding of the ENDOCRINE SYSTEM and the power of music, oils and 12 therapeutic touch points in the raising of the vibration in the chakras, meridians and auric field layers. Karyn will demonstrate a simple protocol for “Musical Meridian Runs”, an “Auric Field Brush-Down- The Shower of Light” and two Chakra balancing protocols using essential oils, aroma-as therapy, music, meditation and the 12 Point Chakra Balance. To understand the Parasympathetic Nervous System and the Sympathetic Nervous System and how we can condition ourselves to enter a state of healing with any given time frame. To learn how to reboot the energy centers on a spiritual, emotional, vibrational, energetic level. 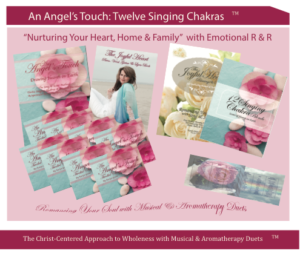 To learn “The Singing Chakra: 12 Point Method” and to be introduced to “The Twelve Point Chakra Balancing System for Generational Healing” (4 CD set) by Karyn Grant, LMT.